Armand having his share. While OPah looks on. Showing his skill on 'my' favourite bowling .... that's what he told everybody. Never strike though. Playing with daddy's toys....Tokki bought when daddy was about his age. It been well kept ever since. 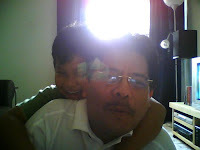 Whatever ,still like to be under dad's ketiak.